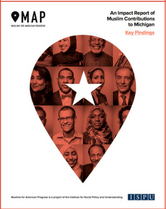 This is a summary of the key findings of An Impact Report of Muslim Contributions to Michigan. To fill the widespread gaps in knowledge about Muslim American citizens, including their positive effect on the country, the Muslims for American Progress project quantified the contributions of Muslim Americans in the state of Michigan. We did so by analyzing contributions across eight key areas: medicine; science, technology, engineering, and mathematics (STEM); civics and democracy; philanthropy and nonprofit; education; economics; arts and entertainment; and sports. Our researchers quantified Muslim American contributions by combining hard facts with human faces. We achieved this goal by profiling individuals and organizations of distinction that showcase the community's diversity and reveal important and oftentimes overlooked contributions by Muslims to the state. Michigan's Muslim community serves as a case study for the rest of the nation, and the findings from this project are in many ways indicative of Muslim contributions across the United States. To our knowledge, this is the first analysis of its kind that explores the dynamic ways in which Muslims contribute to wider American society. Insert your information to download the key findings.